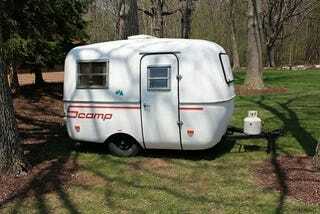 Scamp 13' camper, under 1000lbs, sleeps 4, all fiberglass shell for zero leaks. Found one for sale a few hours away for under $2000. The interior is rather excruciatingly '70s though. EDIT: ad was a scam, still want one of these campers though.